Recently we have been getting a lot of calls about wiring the new 22690X and the 22690DC Pistol Grip controllers. It seems people are buying these new Pistol Grip Controllers to replace Toggle Switches or the Slik Stik. What they want to do is cut the Toggle Switch plug(s) off the end of the harness, or the Slik Stik socket off the end of the harness, and use the 22717 Adapter that is included with the Pistol Grip controllers. This way they can still unplug the Pistol Grip in the off season, and also NOT have to replace the existing harness. The 22717 has a plug for the various 22690 to plug in on one end, and the other end is a plug that mates to the 15764 Touchpad Harness. First let me mention the difference between the various 22690 Pistol Grip Controllers. The FIRST 22690 Pistol Grip Controller had a coiled cord, and it also had a memory. Turning off the ignition with the controller on, it remembered what light mode it was in. So if you shut the key off with the plow lights on, and removed the plow, the vehicle headlights would not turn on. All you had to do was turn the controller off and back on, then off, and the Modules would switch back to the vehicle lights. The 22690 did not have the ALM/ARM button in the upper left corner. The 22690X had a straight cord. It had no memory. It also had the ALM/ARM button in the upper left corner. ALM/ARM stood for Automatic Lower Mode / Automatic Raise Mode. ALM when turned on, the lights on the controller would blink once, continuously, and would lower the plow when the vehicle was shifted into reverse. It would raise the plow when the truck was shifted into drive. This was useful for backdragging large areas. ARM would drop the plow when the vehicle was shifted into drive, and raise the plow when the vehicle was shifted into reverse. This was for forward plowing. the lights on the controller would do a double blink continuously. At some point Meyer renamed the ALM/ARM to HFP, which stands for Hands Free Plowing. The 22690X also had built in diagnostics. If there was a loose connection, or if there was a bad connection, the Monitor light on the controller would blink a code. Looking on the back of the controller would tell you what color wire to check based on the number of blinks. It also calculated amp draw, so if a particular circuit was pulling too many amps, the Monitor light would blink letting you know to check that circuit. THIS is VERY important, because if you are trying to splice the 22717 adapter into a 25 year old overheated Toggle Switch Harness, you may run into problems. IF there is too much resistance the Monitor light may come on. IF it does, you will be replacing the harness which you were trying to avoid doing in the first place. THIS is why it is best to buy a NEW 15764 Touchpad Harness with the new 22690X Pistol Grip Controller. In June 2013, as a "running change" the 22690X was replaced by the 22690DC. The DC stands for Double Click. Double clicking any button (up, down, left, right) causes the plow to go fully to that position, without having to hold the button down. It also features a "lights only" mode. By tapping the On/Off switch, the controller lights up yellow, letting you know that it is sending power to the Headlight Modules ONLY to keep the plow lights on. HOLDING the On/Off button, the controller will turn on for all functions, with the controller lighting up green. The 22690DC is called the EZ1 Controller. The HFP button works the same as on the 22690X. the Toggles used Dark Blue and Black over the years. Don't ask me why they swapped the red and black colors, makes no sense. The Orange wire could be connected to the Orange wire coming into the cab that goes to the plow light switch for existing NITE SABER plow lights. It will turn the plow lights on automatically when the controller is turned on. 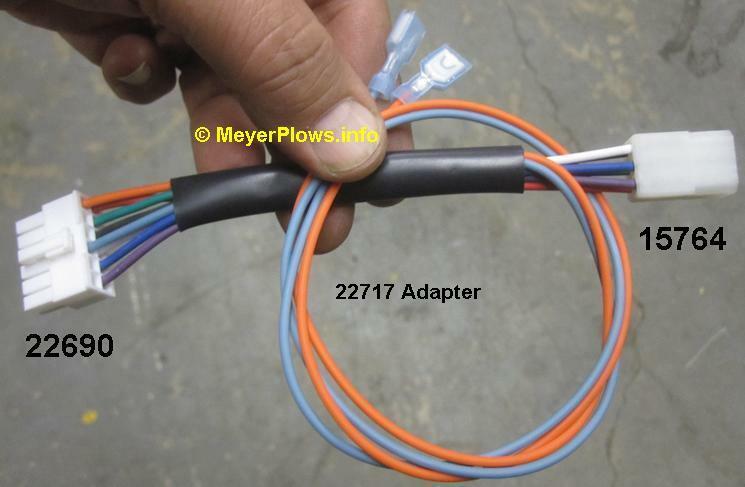 This Orange wire will ONLY work with Nite Saber plow lights. The Light Blue wire, IF connected to the Vehicle Reverse Lights is necessary for the HFP to work. This wire MUST ONLY sense power when the vehicle reverse lights are on. BE CAREFUL because on most newer vehicles the reverse light fuse in the fuse box has constant power. So you will have to find it elsewhere, even if it means running a wire back to the taillight.